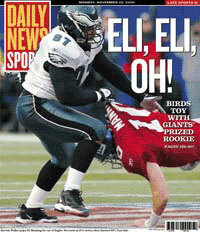 My least favorite professional athlete of the moment: Eli Manning. Some background: Eli was a star quarterback at Ole Miss and was expected to be the first all-around pick in the 2004 NFL draft, which would have sent him to the San Diego Chargers. But poor Eli didn’t want to play for the Chargers, since they weren’t considered to be a serious contender this season. So his father, Archie Manning (who just happens to be an inductee in the College Football Hall of Fame) helped Eli work out a deal so he could play for a supposedly better team, the New York Giants. Hey, Eli, that’s not the way the draft works — you don’t get to pick the team; the team picks you. Thousands of NFL players, many of them more talented than you, signed their contracts without a single complaint. Aside from your last name, what makes you so special? Anyway, considering the selfish way in which this kid joined the league, I’ve been pleased to hear that he’s been struggling. In his first two starts — a loss to the Falcons last week and a rout by the Eagles yesterday — Eli has completed only 23 out of 58 passes (39.7%) with just one touchdown and four picks. Based on those numbers, I think his quarterback rating is actually a negative number. And here’s the O. Henry plot twist: the Chargers — the team that Eli Manning shunned in the draft, the one he thought he was too good to play for — are currently leading the AFC West with an 8–3 record. Meanwhile, his team of choice, the Giants, have dropped to 5–6 after four straight losses, and he’s directly responsible for the last two. As my friend Larry observed, the Bolts are actually better off without young Eli. Enjoy watching the playoffs from your couch, you whiny little punk! Not sure why that memory has stayed with me for so long. But at the time, when I saw that one-liner on the wall, I thought: I’m going to like this place. Congratulations to Camden, N.J., for being named the most dangerous city in the nation, although those of us who live in the Philadelphia area have known and accepted that fact for years. The math is pretty simple: one wrong turn in Camden = one dead body. The study (which depicts someone wielding a crowbar right on its front cover), found that Camden had surpassed Detroit, last year’s most unsafe town, to capture the dubious title. However, given the ugly riot at the Pistons/Pacers game last Friday night, most people probably won’t remember that the Motor City fell to No. 2 in crime behind Camden — but they’ll certainly recall that infamous game in Detroit for years to come. Speaking of which, can you imagine if that brawl had taken place here in Philadelphia? Sportswriters seem to delight in reminding their readers that Philly fans once booed and threw snowballs at Santa Claus at an Eagles game — an event that’s almost always exaggerated, and one that took place in 1968! Considering our town’s penance of 36 years and counting for that relatively mild outburst, the media would have a field day for centuries if players from a Philadelphia team ever decided to storm the stands and attack the crowd. My job doesn’t really require much travel, but I was excited about the chance to attend an annual team meeting in Durham, N.C., following a recent department reorganization. From my experience at previous employers, team-building gatherings are often a colossal waste of time, but I’m pleased to report that our meeting for GSK was both productive and fun. In spite of its major financial and customer service problems, US Airways offers at least one convenience — you can print your boarding pass right from their Web site up to a day in advance. All you need to provide is your name, departure city, and flight number, and you can avoid those long check-in lines at the airport. You can also change your seat using the same online check-in process. Generally, I’ve opted to sit toward the front of the plane so I can disembark quickly after landing. But now, at least for short trips that don’t require much luggage, I’d recommend selecting a seat toward the back instead. A while back, my friend Larry sent me a great link. It was a New York Times article that, in keeping with the paper’s formal editorial style, referred to Kid Rock as “Mr. Rock” — which sounds rather silly, and gives the performer a title of respect that he doesn’t quite deserve. Memo to the NYT editors: feel free to loosen up once in a while. Mr. Clean — the bald, muscle-bound guy in your kitchen floor’s reflection? Mr. Peanut — the only legume to wear a top hat and monocle? Mrs. Butterworth’s — the bottle of maple syrup that actually talks to you? And do they refer to products named for real people in the same way, such as Mrs. T’s pierogies, Dr Pepper (no period in the name, thank you), and Dr. Scholl’s shoe inserts? Stop passively watching the cashier bag all $200 worth of your groceries in the check-out line at the supermarket. Unless you have a screaming child to deal with, it wouldn’t hurt to pitch in and bag a few items yourself. Stop merging onto the highway at 35 mph when I’m driving behind you. The surrounding traffic is moving at twice that speed. You’re going to get us both killed in an accident, and that would really ruin my week. Stop making empty threats about moving to Canada. One guy won the election, the other guy lost, and despite all of your hand-wringing about our collective doom through 2008, the sun will surely rise again tomorrow. In case you hadn’t heard, George W. Bush was reelected to a second presidential term. I had endorsed and voted for John Kerry, so I’m disappointed that he didn’t win. But I’m more baffled that Bush did win, considering that his first term resulted in over 1,000 military casualties, a record federal deficit, and global contempt for our country. To me, Bush getting reelected based on such dubious accomplishments is like Peter Gibbons receiving a promotion for goofing off in the movie Office Space — the reward doesn’t seem justified at all. So, why did Bush win? I tend to think that many Bush supporters made their choice based on fear (as though the U.S. would automatically become more vulnerable to terrorism under Kerry) and morality (as though a candidate’s views on abortion or capital punishment are all that matter, even after a cataclysmic event like 9/11). Given all of the domestic and international problems that were facing Bush, this was Kerry’s race to lose. But the Democrats blew it — the challenger lost by 34* electoral votes and an astounding 3½ million popular votes. I can only imagine how the losing team must feel today. Everyone from ordinary liberals to Hollywood celebrities to partisan blowhards are probably despondent over their collective defeat. All that enthusiasm, all that momentum from the debates, all that hope for a “fresh start” — and nothing to show for it. The Democrats need to take a long look in the mirror and figure out why their message is falling on deaf ears. Aside from the Northeast and the West Coast, the GOP owns the country right now, and too much support for either party is not a good thing. But take comfort in some good news: no more political ads for a while! * Update: When Bush first achieved the necessary 270 electoral votes to win, the original deciding margin was 18 electoral votes. The final edge was 34 (Bush 286, Kerry 252). Last week, my friend Todd called me, saying that he’d applied for two tickets to see a taping of the Late Show with David Letterman for my 30th birthday. We would be guaranteed tickets as long as one of us could answer a trivia question about the show, and he deferred that task to me, since I watch the show more often. Fortunately, I knew who Biff Henderson was, and we were in! What a great day trip — we enjoyed an inexpensive, hassle-free train ride to Penn Station on New Jersey Transit, ordered tasty sandwiches from Rupert Jee at Hello Deli around the corner from the studio, and then attended a lively taping of the Late Show at the Ed Sullivan Theater. The guests included Boston Red Sox outfielder Johnny Damon, actress Anne Heche, and rock band The Donnas. It was a solid lineup — I can’t remember laughing or clapping more often in a one-hour span. Check out the Late Show newsletter, the Wahoo Gazette, for all of the proceedings. After the taping concluded promptly at 6:30 p.m., Todd and I walked over to the ESPN Zone in Times Square for some beers and nachos, then headed back home on the train. Quite a unique and memorable birthday gift!